If you’ve seen one baby spoon you’ve seen them all, right? Nope. The OlaSprout 100% food-grade silicone spoon from Portland, Oregon based company Olababy, mimics nature with its leaf-inspired design — making it the ideal self-feeding training spoon for babies. 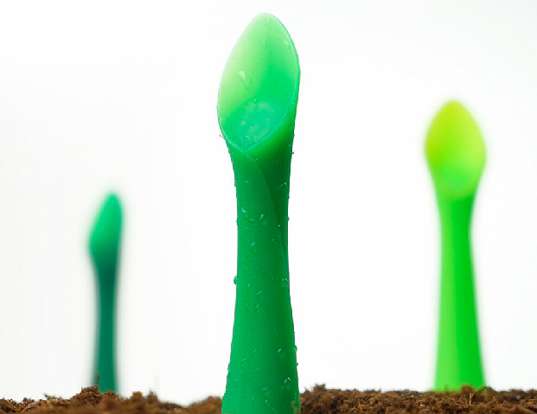 In addition to being aesthetically appealing, this verdant utensil is bendable, soft on baby’s gums, and easy to grip. It’s flexible tip makes it super easy for the tiniest hands to scoop up food. It also doubles as a safe teether and it’s 100% BPA-free. If you've seen one baby spoon you've seen them all, right? Nope. The OlaSprout 100% food-grade silicone spoon from Portland, Oregon based company Olababy, mimics nature with its leaf-inspired design -- making it the ideal self-feeding training spoon for babies. In addition to being aesthetically appealing, this verdant utensil is bendable, soft on baby's gums, and easy to grip. It's flexible tip makes it super easy for the tiniest hands to scoop up food. It also doubles as a safe teether and it's 100% BPA-free.